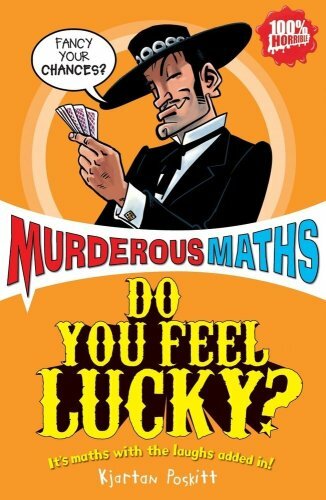 I thought that Murderous Maths was a great book. It is short, but packed with information. The book starts out by talking about the basics of math (+, -, =, x, -:-). Then, Murderous Maths moves on to discuss things like time, short cuts for problems, Roman numerals, calculators, time, clocks, right angles, the invention of nothing, mathematicians, and the magic square. Eventually the author talks a little bit about algebra and why it is useful. What I think I liked the best was the way the author put in little humorous anecdotes so as to keep your interest. (1) “If you have 1 bacteria particle, and if it multiplies 2 times every ten minutes, how many will you have in 24 hours”? “Answer: 22,300,000,000,000,000,000,000,000,000,000,000,000,000,000,” (a lot). As you can see, the problems in this book are strange and unusual, but the author uses common everyday mathematics to solve them. I think that this was a very enjoyable math book and recommend it to anyone who wants a fun read. More Murderous Maths is more of the above, it differs only in that the art gets a little less sketchy, and the writer realizes that he's going to be doing an entire series and, therefore, brings up many topics that will be in later books in detail. The front cover cartoon shows three men in prison, and one of them says, "So, if it takes 10 men 6 years to dig a tunnel using spades, how long will it take us 3 using this plastic spoon?" The entire book is packed with that kind of thing. The only way for this math to become murderous is for you to die laughing. It goes through geometry, critical thinking, volume, dimensions, measurements, impossible shapes, percentages and interest, speeds, etc, etc, etc. Compared to the first book, this book is a 10. 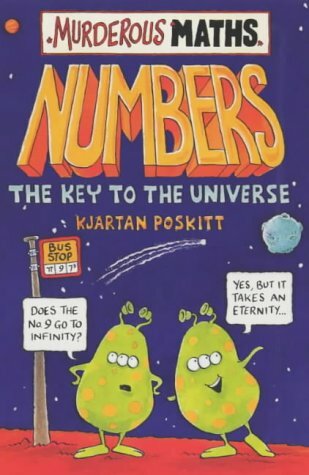 I rate the first book a 7 out of 10 because the cartoons aren't as funny and the math is more boring (plus the evil Gollark aliens don't make their appearance until the 2nd book). This book gives more insight as to what you already know if you have about 4th grade math. I recommend this book for 3rd grade and up to about 8th grade. 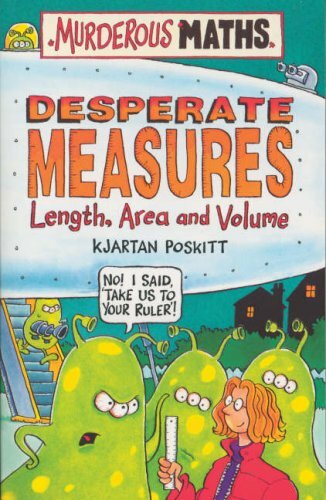 Desperate Measures is one of the less entertaining books in my opinion, but it is definitely worth reading because of the 2-part Archimedes comics. These tell the classic story of when the king gets a new crown, but the goldsmith cheats him, and gives him 1/3 silver which is much less valuable. Archimedes figures out in the bath ("Eureka!" "Well, you don't smell so nice yourself!") that by adding himself to a full bathtub, the water that spills over is equal to his volume and weight. So he runs to the king, takes a bowl of water, marks where the water line is, dunks the crown in the water, marks that, then puts a lump of gold in weighing the exact same as the crown in, marks that, and it turns out that the crown used up more space, or volume, than the lump of gold. Therefore it was proven that the goldsmith cheated him, and he was sentenced to death. The second part is when the cheating goldsmith calls his lawyer, and his lawyer claims that the first proof was insufficient. Archimedes then proves his buoyancy laws by weighing the gold and the crown under water. All in all it is a worthwhile read, even though I rate it an 8 out of 10. For 4th grade and up to about 8th grade. If you were a pigeon flying over a railway station that could hold 200 people, but was only half full, and suddenly you had to go, what is the probability of you hitting a person down there? Work it out. Let's say, half of the people down there were men. What is the probability of you hitting a woman? Work it out. This book is about probability. Probability is saying, "There is a 50% chance of rain today with scattered hail to boot" (actually the weatherman's name is likely not Probability, but still . . . ) Then there's the coin toss with Professor Fiendish, your arch-nemesis. He offers you the chance to win a coin toss, toss 6 coins, win 60 pence (this is a British book remember). Using Pascal's triangle, you figure out that the probability of you getting all heads is more than one in 60. The Professor's electric meter runs on coins. How do you run him out of coins for his electric meter so that you can escape from his electrified titanium tent? The answer is, look at Pascal's triangle! By losing one coin at a time, you raise your chances of winning. Eventually you run the Professor out of coins, and you're able to walk outside, your pockets full of pence (money). Then there's the probability of winning a million British pounds by tossing 3 coins in the air, waking somebody up and saying "I will bet you that if I toss these three coins in the air, at least 2 of them will land the same way!" If they take your bet, it's a sure thing you're going to win. Try it! This books also goes through interesting numbers, such as the probability of winning the national lottery jackpot is one in 13,983,816. So winning the jackpot is actually easier than throwing 24 straight heads on 24 coins. It goes through factorials, and there's combinations, permutations, "dice, dates and devious decks" - gambling. I rate this book an 8 out of 10. This book is for 5th and up to say 8th grade. 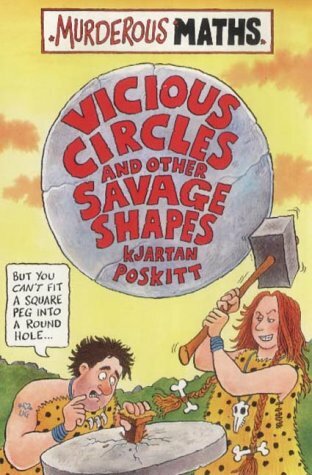 Vicious Circles and Other Savage Shapes starts off with a chapter called "The Secret Vault" where you get to go and see the most famous sand drawings ever. This zone doesn't use ANY numbers, unless you want to. All you need are one or two decent pencils, a ruler, scissors, a geometrical compass, clean paper, and a protractor. This book is obviously about geometry and throughout the book you see a furious judge yelling, "PROVE IT!" It talks about Pythagoras, Thales, and other fathers of geometry. It talks about angles, shapes, radii, perpendicular bisectors, and angle bisectors (how not to get splattered against the wall of a magnetically charged cave on your cosmic phazmacycle, watch spellcheck hiccup), impossible shapes, why triangles don't collapse, and then it talks about dimensions. From the book: "Suppose there's 2 flies that are absolutely bugging you. You could borrow a laser beam that fires a very thin beam of light in a straight line. Using the laser beam, you could bore a hole in both flies at the same time, provided you pointed it in exactly the right direction." That is the first dimension. "You don't have any choice, there is only one direction you can fire the beam in, and that depends on the position of the 2 flies. To put all this in mathspeak, 2 points define a line . . . The 2 flies call up reinforcements and to your horror a third tiny fly appears. If you're really lucky you might find all three flies in a straight line, but it's not very likely." Or probable. "However, our weapons depot can issue you a very long, very wide and very, VERY thin sheet of glass. Ha! Now you've got 'em." Complete with appropriate illustrations, (Chung! Eeeeek! from the flies . . .) And of course he shows you how to deal with 4 flies . . . I rate this book a 9 out of 10, for 4th grade and up to say 8th grade. There's a warning inside this book that says "Any book with the word 'Murderous' on the front is not going to have lots of nice stories about flower arranging, handy hairstyling hints or recipes for fairy cakes in it. 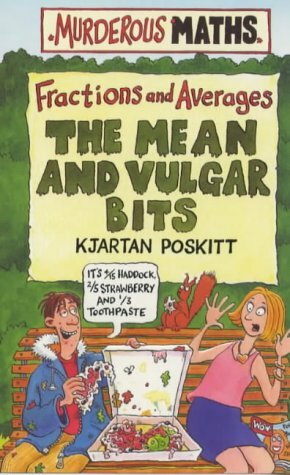 If a book is called the Mean and Vulgar Bits, don't be surprised if you find some mean and vulgar bits inside. Remember that the word 'bottom' has two meanings and in here it is necessary to encounter both of them." You are introduced to the very vulgar fractions in cartoons where the little fractions are "sniggering" at the big fractions who are pulling pranks. in defining the numerator and the denominator, you encounter one of the uses of the word "bottom" as the denominator's gleefully shout the word across the page. Then you are introduced to the gangsters, which are in, by the way, every book. They are trying to learn how to divide 3,000 BP between seven people. The reason the math is murderous is because as they are fighting over the last odd cent, they accidentally knock over a candle, which burns the money, which in turn starts to burn the oil reserves next to the table. The gangsters get out in time, but the shack they were hiding out in isn't so lucky. Page 25 evinces a chuckle as you see a boxed "Recipe for Fairy Cakes" looking like it is scribbled out with a Sharpie marker. "Good grief! 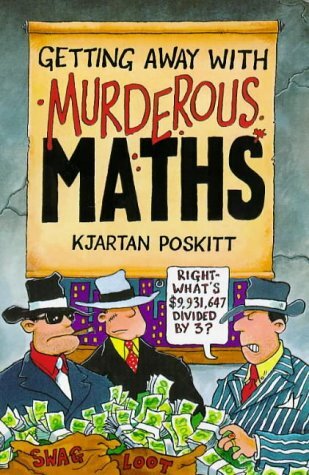 This is supposed to be a book about murderous maths. And yet a recipe for fairy cakes nearly managed to sneak in. We don't need to be told how to do soppy stuff like that. Instead we'll just mix up whatever we can find in the cupboard." Which leads to another cooking/baking chapter of division and fractions. . . . I rate this book an 8 out of 10, for 3rd grade and up to say 8th grade. If you thought that any of the other books were good, you obviously haven't read this one. This book is my favorite because this goes into almost all of the other number subjects (minus geometry), and it's the thickest book yet, so there's more of the good stuff. It goes over such stuff as useless numbers, Fibonacci numbers, superstitious and lucky numbers, prime numbers, irrational numbers, triangular and square numbers, and my personal favorite, binary numbers and number bases. Amicable numbers whose factors add up to each other are in there. It also goes over Fermat's Last Theorem, Euler, and other historical figures, and of course, the gangsters are in this book. Part of this book which is the funniest part in my opinion, is the classic riddle of the missing cent. Get the book to find out what that is. The book has lots of number tricks for just about everything. I like it because it goes over so many subjects. I rate it a 10 out of 10, for 3rd grade and up. This book about Algebra. You may be asking "Who is she?" if you are in 3rd grade. But the rest of us kinda know what algebra is. It scares a lot of people, but there's really nothing to fear. The idea about algebra is, if you encounter a problem that is too hard, back out and tackle an easier problem. It talks about the importance of positives and negatives, and the Phantom X (who looks almost exactly like Zorro) teaches you the five rules for adjusting equations. Interesting though is that the only thing it goes over is algebra (all the other books cover more than one subject), it's just different from the other books. Here is the famous Diophantus riddle (Diophantus is considered the father of algebra): "Diophantus' youth lasted one-sixth of his life. He grew a beard after one-twelfth of his life, then after one-seventh more Diophantus married. Five years later he had a son who lived exactly half as long as his father. Diophantus died 4 years after his son." You may be able to do this, but I suggest you get the book to help you solve it! It talks about how many numbers will fit into brackets, and how many brackets are allowed. And then it talks about your "algebra panic button" - "If you get stuck on an algebra problem, you reach under the desk and push the secret panic button! The curtains around your room will automatically close, an electronic sweeper will check for bugging devices, and the door will lock itself. When the system has verified that everything is secure, the picture of your great, great aunt Marina on the wall will slide open revealing a panel with a formula on it." I can't put the formula in because . . . I can't, it looks pretty hairy, but it has the power to solve almost any equation. This is definitely for at least 5th grade and up, it has a lot of stuff in it I haven't learned yet totally (I'm 12). I just got the book and I usually read these four or five times before I get it all, so I'll wait until then to rate it. In the Fiendish Angletron, your arch-nemesis, Professor Fiendish, challenges you to beat his super-calculator, the Fiendish Angletron. The book goes through trigonometry and trigonomogeometry (try to say that with Bubble Yum in your mouth). This is one of the few books that actually tells you to use a calculator, and you NEED a calculator. A graphing or at least scientific calculator is necessary, because it goes through sines, cosines and tangents, which are just about impossible to figure out in your head, or paper for that matter, and in the real world everybody does these with calculators or computers. It has the usual MM gangsters, Riverboat Lil and Brett Shuffler, the evil gollarks, and it also introduces three new super heros, SuperSine, CosineGirl (CosGirl), and TanDog, for this particular book. The funniest part in the book is definitely the end, which I won't spoil, but I will say that it is very unexpected, and you have to read the whole book in order to get it, so no peeking ahead. Also, be sure not to skip the MM Geometry Set self-assessment test in the beginning. Go for points! I scored zero, I used my calculator the whole time. Overall the book was very good, and had me keeping my mom up until 10:30 p.m. figuring out the end of the book problem. I rate it an 8 out of 10. Definitely for higher grade levels than the earlier books, I'd say middle school on up. This book surprised me. I was not expecting all the formulas in here to turn up. Like the formula for why the Gollarks will be able to interpret with the Ploogs because the Ploogs can't understand them, so they need an interpreter who can speak both of their languages, and it goes on . . . They finally decide that they ended up needing over 1,000 interpreters just to get everybody to understand each other. The comics are hillarious. They end up all getting blown up and finally talking the same language as they scream "ARGHHH!" Then we have formulas for pizzas, how to divide a crescent into three pieces with only one cut, how to divide a crescent into 6 pieces with only 2 cuts (hint, they are not all the same size) and why the pure mathematicians are probably on the wanted list forever. Then we get into formulas for gravitational attraction of Pongo and Veronica (don't worry, it's G-rated). These include Einstein and Newton's famous formulas. Then there is money - formulas to figure out percentage markups to make 50% profit on resale. Then it goes backwards - they paid me this, how much did it cost me? It's all in English currency but who cares, the math is the same whatever currency you use as long as it's decimal based! There are formulas for calendar algorithms, like what day your birthday fell upon. There are geometric formulas, like how to figure out the longest diagonal in irregular and regular figures. Hint: Once you get to a certain number of sides, use your ruler! See? Spookyyyy . . .
Near the end, we have - At Last! The Tragic Tale of The Perfect Sausage. No spoilers posted here, but it truly is tragic! The final comic I won't spoil either, but it's VERY funny. I rate this book, easily, a 9 out of 10. A little of it was over my head, but I liked it anyway. I recommend this book again for middle school on up. Because it goes through a lot of formulas, it takes a while to figure out. There's a lot of vocabulary you probably never saw, but he does explain it.